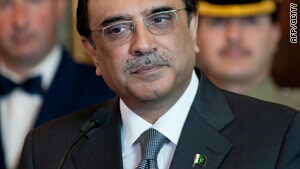 Pakistan President Asif Ali Zardari is heading to the U.K. despite tensions between the two countries. Pakistan official says Cameron's comments are "against the facts"
(CNN) -- Pakistan's president will proceed with a scheduled visit to the United Kingdom this week despite recent tough remarks about his country's handling of terrorism from the British prime minister, officials said. "There is no reason to bark at each other. We have had good relations in the past and we want to progress our relations," Pakistan Information Minister Qamar Zaman Kaira said Saturday. Kaira's remarks to reporters in London, England, came after a Pakistani military official confirmed that the country's spy chief's planned visit to the U.K. had been canceled after British Prime Minister David Cameron told an audience in India that Pakistan shouldn't export terror. "We want to see a strong and a stable and a democratic Pakistan," Cameron said in Bangalore, India on Wednesday, "But we cannot tolerate in any sense the idea that this country is allowed to look both ways and is able in any way to promote the export of terror, whether to India or whether to Afghanistan, or anywhere else in the world." Kaira described Cameron's statement as a "misperception" that was "against the facts" and "not in good taste," but he said he expected the bilateral meetings between Pakistan President Asif Ali Zardari and U.K. officials this week to be fruitful. "The president of Pakistan will have dialogue and good discussion and he will explain the facts to the new government over here," he said. Some critics in Pakistan have called for the president to cancel his visit. One group of protesters burned an effigy of Cameron. Gen. Ahmed Shujaa Pasha, the head of Pakistan's Inter-Services Intelligence, planned to visit Britain in early August to discuss security cooperation between the two countries. But the trip was scuttled after Cameron's comments, according to a Pakistani military official, who asked not to be named because he was not supposed to talk to the media. Kaira said Saturday that the trip had been postponed due to other commitments.